Dean from Australia: The Victorian Trooper #8 - Family Ties. Joseph Ladd Mayes' career trajectory was already on the rise, even as the events of the Kelly Affair were still playing out. He received his first promotion just prior to the capture of the Kelly Gang in April 1880. At the recommendation of Superintendent Francis Hare, Joseph Ladd was promoted to the rank of Senior Constable in mid 1879 - not long after his secondment to the Police parties and just after his posting to Lancefield north west of Melbourne. Despite the protestations of Constable Alexander Fitzpatrick and the two reported petitions from the townsfolk of Lancefield urging his reinstatement, his dismissal by Joseph Ladd Mayes seems not to have affected Joseph Ladd's position at Lancefield. He remained the Senior Constable in charge from 1879 to 1885. "their high appreciation of the zeal, skill and activity displayed by Senior Constable Mayes". Service Record of JL Mayes 1885. In September that same year Joseph Ladd transferred to Kyneton to take take charge of the station there. The posting was a brief one, however, for it was not too long before he was drawn back to Lancefield and he saw out the remainder of his career there. In their private life Joseph Ladd, his wife Eugenie and Joseph's three children from his first marriage John Adolph, Rebecca and Sara seem to have prospered. Though Joseph and Jane were approaching middle age, they enjoyed a rather prolific second round of parenthood, welcoming their first child Florence Marion in 1881. Florence was followed by Dorothy Susan (1882), Eugenie Douglas (1884), Joseph Ladd Jr (1885), Edward Burke (1888), Mary Madge (1890) and Norman Hector (1893). While we assume the family experienced their most happy period - and we have no evidence to suggest it otherwise - we have a fragmentary picture of what their life was like. The eldest child of Joseph Ladd and Mariann Mayes, John Adolph, appears to have had a thirst for adventure, such that by 1888, he had been living far from his birth place in the town of Wilcannia in NSW. John Adolph is the subject of an article of his own, penned by his descendant Allen Mayes. Rebecca Mayes - the second child of Joseph & Mariann provides us with the most tangible piece of their life in the 1870's. A letter, written by Rebecca to her brother John Adolph, dated 1877 gives us an insight into the life of the Mayes family. It also shows a glimpse of the man Joseph Ladd was - meticulous (pointing out errors in Johnny's grammar), and his dedication to service. (Letter from Rebecca Mayes to her brother John Adolph Mayes, written from Broadmeadows, dated 1877. We received your letter in time; Papa said it was a capital one; you made two slight mistakes; you put two ls~ in holidays and only one h’ in whether. Papa showed your drawing to Mrs. Rodda, she said it was very good. Mr. Rodda gave it out in church on Sunday evening, that he was going to commence a Confirmation class on Sunday the 12th inst. Harriet Dutton, Sarah and I had our names put down. I do not know if there will be any more from here. Papa was at the Williamstown races on Saturday, he was not home till after nine o’clock, he was at the Flemington races today and he will have to attend there on Thursday and Saturday. Papa left Rhoan in the Depot today as he is quite lame, the horse Papa has now is smaller than Rhoan and is a pretty grey. We had Mrs. Shannon washing here today, and I had to shut Rhoan in the stable nearly all day because he kept pushing her and flying at her. Momma says that when you buy a hat, get one that will not lose it’s shape the first wetting it gets. I am getting on very well with my music now, I got a lesson today. Sarah is a good player now, Miss Eliza says she can play the "Reaper’s Polka" and the "Cornflower Valse” very well. (A guess has been made of the name of Joseph Ladd's horse - Rhoan. The name of Rebecca's cat is much harder to decipher therefore x's have been left in it's place). No photos currently exist of Rebecca. So far as we know she did not marry. It is apparent that Rebecca worked as a post mistress at Pakenham in Victoria but for how long is unclear. In Joseph Ladd Mayes' will he specifically set aside 25 pounds for Rebecca Mayes who was, at the time of his death, living at Brighton, probably at the Union Street residence of her parents. Rebecca died in 1929 at Pakenham. Sara Mayes, Joseph & Mariann's third child Sara was barely 16 years old when her mother died in 1878. Some time around 1885 Sara began a courtship with a young mounted Constable named Peter O'Shannassy who - it is believed - was stationed at Kyneton, Victoria and may have even been under Joseph Ladd's command when he was stationed there. Sara and Peter O'Shannassy were married at Boondara in Victoria on 11th November 1885 and eventually moved to the Tarwin Lower District of South Gippsland, Victoria. Peter and Sara had three children, Marian Cicely born in 1886 at Lancefield, Victoria, Barbara born 1889 at Tarwin Lower, Victoria and Allen Neil born 1895. Sara O'Shannassy (Mayes) with grandson Harold Mountain, c.1930's. Peter O'Shannassy died in 1919 and was buried at the Tyabb cemetery near Hastings in Victoria. Sara O'Shannassy (Mayes) died on August 8th 1940 and was buried with her husband at Tyabb. Apparently no headstone was erected. Florence Marion Mayes - the first child of Joseph Ladd & Eugenie Mayes was born at Broadmeadows in 1881 though the exact date is unknown. Florence Marion spent much of her early life at Lancefield. (Florence Marion Mayes - date unknown). She married a divorcee Augusta Sandford in January of 1909. Sandford was a Lieutenant Colonel in the British military who signed up at the outbreak of WW1 and seems to have gained some notoriety. At the very beginning of the 1914 - 1918 conflict Sandford was commander of a fort at Queenscliff on the western tip of Port Phillip Bay in Victoria. 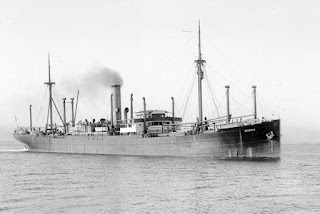 A German steamer called the "Pfalz" which was docked in Melbourne attempted to leave upon hearing of the outbreak of war. Sandford urgently requested an order to fire on the "Pfalz" to stop it from escaping through Port Phillip heads and was given it. Thus Augusta Sandford was regarded as having fired the first Australian shot of the war. (The German steamer Pfalz - rebadged as an Australian ship after it was captured at the outbreak of WW1). Augusta and Florence had no children of their own. Two son's from Sandford's previous marriage, Horace & Arthur probably gave Florence a mothering role. Florence Marion was recorded as 21 when her father died in 1902 and she was 58 when her mother died in 1939. At this stage it is unknown when Florence Marion died. Dorothy Susan was born in 1882 around the time when Joseph Ladd was participating in the Police Royal Commission. Very little is known of Dorothy other than she was 20 when her father died in 1902 and was 57 when her mother died in 1939. Dorothy married a Lewis Coates. We don't know if they had children, nor do we know when Dorothy died. Dorothy Mayes - date unknown. Dorothy Mayes on ladder with Mary holding their mother Eugenie. These photos were taken on New Year's Day 1918 at Brighton, Victoria by Cicily O'Shannassy. Eugenie Mayes was born in 1884 probably at Lancefield. Eugenie married one G. McLeod but we don't know when that occurred. She was 18 years old when her father died in 1902 and she was deceased by the time her mother died in 1939. (Eugenie Mayes - date unknown). Joseph Ladd Mayes Jr. was born in 1885 at Kyneton in Victoria. Joseph Mayes is the subject of his own article, which can be found here. Joseph Ladd Mayes, taken New Year's Day, 1918 at Brighton, Victoria. Joseph Ladd & Eugenie's 5th child Edward Burke Mayes was born sometime in 1888, however the exact date is unknown. As with others in his family Edward's life is mostly a mystery. He was 14 years old when his father died in 1902 and 51 when his mother died in 1939. Mary Madge Mayes was born in 1890, probably at Brighton in Victoria. She was 12 years old when her father died in 1902. Mary was known affectionately as Mollie. She is known to have married a Harry Coles but no other information exists. She was listed as 48 years old on her mother's death certificate however this should read 49. Mary Mayes posing with her husband Harry Coles on New Years Day, 1918 at Brighton, Victoria. The last of Joseph Ladd's children, Norman Hector was born in 1893 making him only nine years old when his father passed away in July, 1902. Norman Hector was known the Mayes family currently residing in Gippsland, Victoria. Dorothy Mayes, wife of Joseph Ladd Jr's son George, recalls Norman Hector being a kindly bachelor who almost always wore a suit, was very well spoken and who looked after his mother in her later years. Norman Hector lived nearly all of his life in Brighton, Victoria. He died in 1955. The Mayes family certainly grew exponentially, even as Joseph Ladd was approaching his 60th year of life. Their presence in the Lancefield district was a constant - aside from the brief posting to Kyneton, east of Lancefield - from the period of 1879 until Joseph Ladd retired from the Police Force in 1895.